Buon viaggio means bon voyage or "have a great journey". 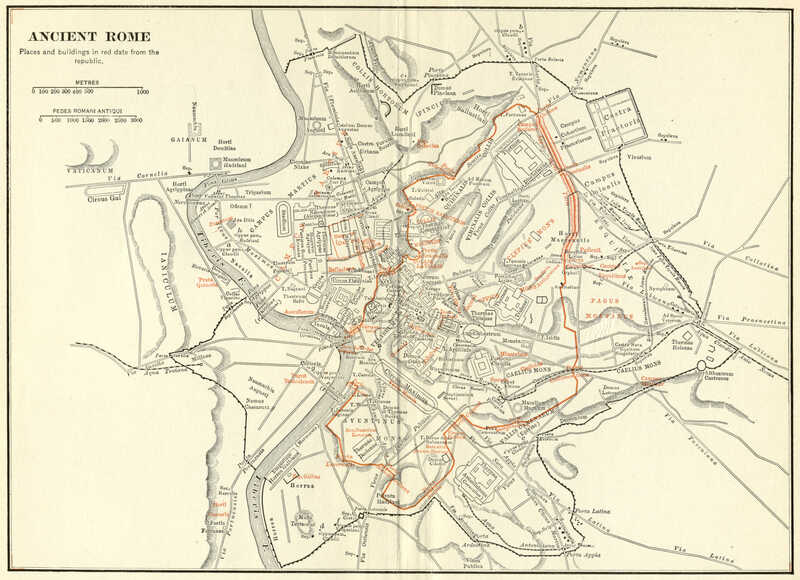 To get you started on that trip, we thought we'd show you maps of Rome Italy that will help you start to understand this famous, vibrant, and ancient city. The selection will get you oriented by placing Rome in the context of Italy and the rest of Europe and by presenting an interactive street map of modern Rome. We also show a graphical map of Vatican City, the ancient Roman Forum, and a quick idea of the layout of the ancient city. Perhaps best of all, we tell you about our three favourite, easy-to-carry, maps of Rome. It makes sense that Rome, the capital city, would be located just about half-way along the length of this boot-shaped country. You'll also note that Rome is half-way between Monaco (and France) and Tirana in Albania — clearly a number of different cultures influence Rome today. On the above map Vatican City seems to be the same size as Rome and just outside of it. Neither is correct — the Vatican, an independent country, is surrounded by Rome and is much smaller. This interactive map shows the location of the top sites and attractions in Rome and allow you to resize the view. You can also click on "View larger map" to give you an even broader view. We like to have a printed map in hand as we explore great European cities like Rome. Maps are an easy and quick way to find out what's around you and where you want to go next. Lightweight, laminated, fold-out map. 1:17,000 scale — a bit small. Waterproof, tear resistant. Includes points of interest and Vatican map. 1:9,6000 scale — easier on the eyes. Our overall top choice (shown above). Michelin is the standard in maps. Includes booklet, fold-out map (that can be a bit awkward to use on the streets), complete street index. 1:8,000 scale — very easy on the eyes. In a unique situation, Vatican City is an independent country surrounded by a city! It is, of course, the centre of the Catholic church, but it's also a repository for some of the greatest works of art and architecture — especially of the Italian Renaissance. The Vatican is to the west of Rome city centre (centro), on the west bank of the Tiber, but easily reachable on foot from the other sites of the city. If you're going to go underground, you need a map! A relative latecomer to underground urban transport (1955), Rome just recently opened its third Metro line. The lines are easy to navigate and get you places fast. Since it's not as extensive as, say, the Paris Metro, there are a limited number of places you can get to. However, Line A (the orange line in the map) takes you close to the Pantheon and Trevi Fountain. Line B (blue) has service to the Colosseum and the Roman Forum, and takes you close to the Circus Maximus and the Baths of Caracalla. Luckily, for other sights, Rome is an eminently walkable city! Over the past 3,000 years you'd expect Rome to have changed. And it has! But, it's the Rome of 2,000 years ago that most captures the imagination — when it was the centre of the Roman Empire. It's fun to look at a map of the imperial city to see how the city was laid out. The ancient city walls are mostly gone, but there are plenty of recognizable aspects to modern Rome, mostly in the form of ruins and remains of its former self. One of the most extensive remains of the ancient city is the Roman Forum, which was the centre of political and financial life. There you could see triumphal processions, celebrating Roman military victories; hear political oratory; and even see some gladiatorial contests. If you've read Shakespeare recently (or Plutarch) you'll remember that Marc Antony gave his funeral oration for Caesar in the Forum. For the map shown here, the original diagram was done by Samuel Ball Platner, The Topography and Monuments of Ancient Rome (1904) It's been modified by Mark James Mille, Wikipedia Commons.